Reclaim your Yard with a Unique Pest and Lawn Solutions Barrier Spray Package. One professional grade barrier spray will help protect your family from annoying and potentially dangerous mosquitoes for 21 days. Our innovative spray eliminates adult mosquitoes and ticks on contact. 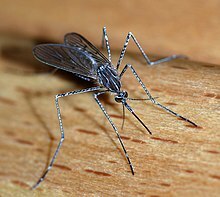 Then, new mosquitoes attempting to invade your property will be killed or repelled as they rest or feed. Our barrier spray is also effective at eliminating other nuisance pests such as fleas, flies, wasps, midges, and nats. Treatments are scheduled automatically, with our licensed applicators treating your property from a backpack misting systems every 21 days. An average yard takes around 15-20 minutes to treat. After 30 minutes the spray is dry and family and pets can safely return to the yard. We will always give you advance notice for all treatments. You don’t have to be home for the treatment and we’ll leave a notice that your treatment was completed successfully. Our applicators will also walk your property and inform you of any additional measures you can take to prevent mosquito breeding. We also apply a larvacide to any ponds, large puddles, or other bodies of water that can contribute to mosquito breeding on your property. Pets and children are at increased risk for mosquito borne disease. Two out of three cases of Rocky Mountain spotted fever occur in children under 15. Encephalitis is also more likely to be fatal or permanently debilitating to the very young and the very old because of weakened immune systems. Mosquito borne heartworm is a common disease in dogs and can be fatal. Unique Pest and Lawn Solutions Pest Solution season long treatment package helps protect your family and pets from mosquito borne diseases. Even with all the proper precautions, it is impossible to be 100% protected from mosquito borne disease. However, taking preventative measures, eliminating mosquito breeding grounds, and knowing early symptoms of insect borne illness can go a long way in protecting your family, friends, and pets. Protect family, friends, and pets from tick-borne disease. • Your yard is adjacent to woods, fields or tall grasses. • Your yard has a wall fence. • You or someone in the family are frequent gardeners. • Your children enjoy playing in or near fields, trees or tall grass. • You have a lot of trees, shrubbery or dense groundcover plantings on your property. • You have a brush, wood, leaf litter, or a compost pile on or near your yard. • You have pets that love the outdoors. Unique Pest and Lawn Solutions abides by all local, state and federal pest control laws and procedures. Our mosquito control techniques have been approved by the US EPA. We can offer a variety of barrier spray formulations for unique circumstances. However, the active ingredient common to all of our barrier sprays is a synthetic version of the chrysanthemum flower. This same ingredient is found in many household products including products used to treat scabies and lice. Our barrier sprays also utilize an innovative microencapsulated agent that offers outstanding protection for 21 days. This unique agent allows us to introduce fewer pesticides into the environment while maintaining superior control of the targeted pests.